The unprecedented terrorist attacks against innocent civilians in Paris today have left many with anguish, fear, and shock in their hearts. In the coming weeks and months, politicians and pundits will speak at great length about what happened and what the world needs to do to address the increase of terrorism throughout the world. I do not write in order to contribute to that discussion, but instead, I echo the Russian proverb, “The deeper the sorrow, the closer to God,” and offer humble thoughts for Christians to consider during this difficult time. 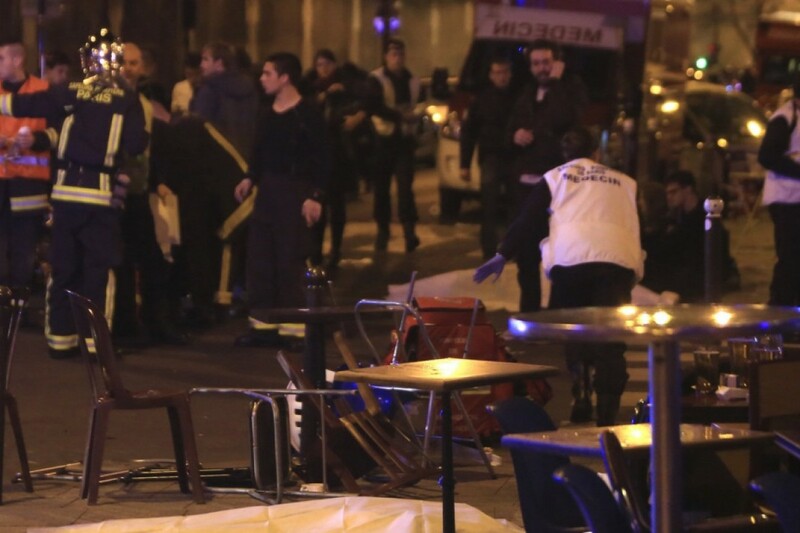 The violence that we witnessed in Paris is part of the larger problem of violence in the human heart. In Paradise, where mankind lived with God in bliss, violence had no existence. It was only after our foreparents, Adam and Eve, disobeyed God’s holy commandment and fell that violence entered into the world as part of the larger corruption that humanity brought upon itself. Once our parents fell into temptation, there was a rupture in our union with God, which, in turn, led to a rupture in our relationships with one another. In the very first moments of the Fall, Adam and Eve, who were blissfully married by God Himself, mercilessly accused each other as if all the love between them had simply evaporated. This violence then spread to their own children, Cain and Abel, and finally, to the whole world. By the time of the righteous Noah, sin and violence had so consumed the world that God sorrowfully regretted His creation and sent the Great Flood to purge and renew the earth. Violence, therefore, is not natural to humanity, but it has become part of our common existence and will continue until the Parousia, the Second Coming of our Lord Jesus Christ. No matter how many people debate it in the media, no matter how many wars are declared, no matter how many nuclear missiles are fired, we will not end violence in our world. What, then, can we do? “For He Himself is our peace, who has made both one, and has broken down the middle wall of separation, having abolished in His flesh the enmity, that is, the law of commandments contained in ordinances, so as to create in Himself one new man from the two, thus making peace, and that He might reconcile them both to God in one body through the cross, thereby putting to death the enmity. And He came and preached peace to you who were afar off and to those who were near.” (Eph 2:14–17). As the Savior of the world, He will end every cause of violence; He will correct every injustice in the world; He will deal the final and crushing blow to Satan and his demons; and He will subjugate all evil and ungodliness under His Feet, as the Psalmist said of Him, “The Lord said unto my Lord, Sit thou at my right hand, Until I make thine enemies thy footstool” (Ps 109:1 LXX). At the same time, in His compassion and lovingkindness to those who suffered violence in the world, He shall “wipe away all tears from their eyes; and there shall be no more death, neither sorrow, nor crying, neither shall there be any more pain: for the former things are passed away” (Re 21:4). Our duty, then, is to endure violence by uniting ourselves with Christ Who shall end all violence with the coming of His Kingdom. At the same time, we must repent of our many sins. In the Holy Gospel, our Lord briefly mentioned a tragic incident that took place in His time. Eighteen men standing near the Tower of Siloam were crushed and killed when the tower fell on them. Consider what our Lord said: “Or those eighteen on whom the tower in Siloam fell and killed them, do you think that they were worse sinners than all other men who dwelt in Jerusalem? I tell you, no; but unless you repent you will all likewise perish” (Lk 13:4–5). Just like our brethren in Paris who were randomly murdered today, these 18 were no worse than anyone else. Our Lord teaches us to respond to such acts of senseless violence by repenting of our sins. Moreover, we must not be overcome with fear, anxiety, and hatred when we hear about attacks like today’s in Paris. After all, who are we fighting? Is it Al-Qaeda? ISIS? Some other group? In reality, “we wrestle not against flesh and blood, but against principalities, against powers, against the rulers of the darkness of this world, against spiritual wickedness in high places” (Eph 6:12). Our war is not against this or that group of people, but rather, Satan and his demons. Since the nature of our war is spiritual, our weapons, too, must be spiritual. In place of missiles and guns, we need the Holy Cross, the Lifegiving and Holy Eucharist, pious prayer, and frequent attendance at church services. Remember that the demons who are ultimately responsible for Paris screamed in terror whenever they were in the presence of Christ. He has complete dominion over them and is able to protect us if we plead to Him on behalf of our families, our churches, our cities, our nations, and even our enemies. This is the type of warfare that will overcome any violence in the world. Finally, we must heed the Holy Apostle’s counsels: “Watch ye, stand fast in the faith, be like men, be strong.” (1 Co 16:13). If we are not being watchful in our relationship with God, events like today’s can easily send us off into bitter bouts of depression and anxiety. If we are not rooted in the Church, it will be easy to fall and be moved with the winds of the world. If we are not imitating courageous athletes, it will be easy to lose sight of the very goal of our lives, which is union with God in His eternal Kingdom. If we are not strong, the violence will overcome us. 3 Responses to "The Deeper the Sorrow, the Closer to God"
Fr. Moses Samaan, thank your for your words of truth. It reminds me not only of the war on terrorist, but the wars in our homes, in our minds and in our everyday lives. Wearing the armour of God at all times and remembering that peace only comes from the Peace Maker. I humbly echo your message.